Big Franchising‘s primary mouthpiece is certainly flexible. As an example, witness a current press release from the International Franchise Association (IFA) commenting on the amended bailout to Wall Street entitled The Franchise Industry Applauds the Government Rescue Plan. 1. This is in support of government’s increased oversight and will reward those engaged in unfettered corporate predatory behavior in a trillion ways (at least, in US$). 2. On the other hand, notice how 12 days ago the IFA was warning (threatening?) Australians that they should not change (READ: increase or improve franchise industry oversight) or all hell would break loose (Blue MauMau: Washington Trade Lobbyist Warns Against Changing Australian Franchise Law). So, it appears, what is good for the U.S. hen is bad for the AUS rooster? 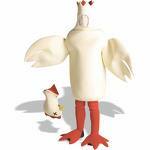 sales of franchises are so pathetic that the IFA is running around like a chicken sans their head. Former U.S. Secretary of Labor and economics professor Robert Reich mentioned on CBC radio on the weekend that this is not a financial crisis: it is much worse (it’s a crisis of trust or confidence). In my opinion, Reich’s blog is a reasonably unbiased source of commentary in viewing the farce of U.S. banking oversight unfold. The IFA are experts at the management of confidence.